A 10-horse field that includes six graded stakes winners will go into line for Saturday’s Grade 2, $300,000 Muniz Memorial Handicap – a mile-and-an-eighth event for older horses over the Stall-Wilson Turf Course. Invading from South Florida is Bricks and Mortar who will make his first start since a victory in the Pegasus World Cup Turf (G1) at Gulfstream Park on Jan. 26. Owned by Klaravich Stables and William H. Lawrence, the 5-year-old son of Giant’s Causeway has banked a total of $3,018,250 in his eight-race career for trainer Chad Brown, who won the 2012 edition with Casino Host. Bricks and Mortar won the first four starts of his racing career, which included stakes wins in the Manila Stakes at Belmont Park and the National Museum of Racing Hall of Fame Stakes (G2) at Saratoga, both in the summer of 2017. He was handed his only two losses in his following pair of outings which took place in the Saranac (G3) and Hill Prince (G3) stakes (G3) in the fall of that year. In both races, he finished third beaten three-quarters of a length. Bricks and Mortar did not race until December of the following year, but returned to action in winning style against allowance optional claiming company over the grass at Gulfstream Park. He was made the 2-1 morning line favorite for the Muniz Memorial Handicap by Fair Grounds odds maker Mike Diliberto and will break from the seven hole under Irad Ortiz Jr. 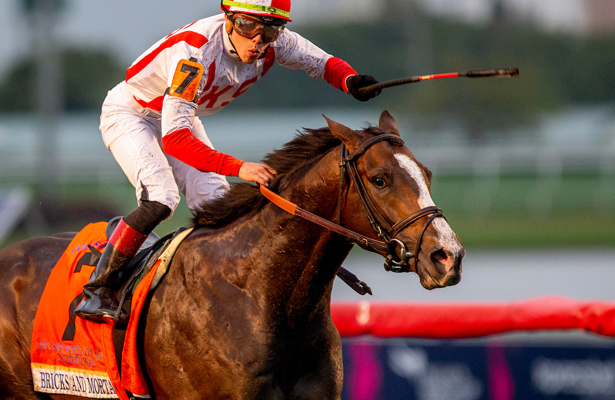 If Bricks and Mortar wishes to score his third graded stakes triumph, he will have to dethrone reigning Muniz Memorial Handicap winner Synchrony who is unbeaten over the Stall-Wilson Turf Course. Owned by Pin Oak Stable and trained by Michael Stidham, the 6-year-old son of Tapit has won all four of his starts over the Fair Grounds lawn, three of which are graded stakes victories. In addition to winning last year’s Muniz Memorial, he scored back-to-back editions of the Fair Grounds Handicap (G3). Synchrony also boasts two graded stakes wins over the turf at Monmouth Park in last year’s Red Bank (G3) and Oceanport (G3) stakes. Synchrony will once again receive the riding services of jockey Joe Bravo and will break from post three as the 3-1 morning line second choice. Another graded stakes winner that looms a threat is Inspector Lynley (post eight, Jose Ortiz, 6-1), who ships from South Florida for Hall of Fame trainer Shug McGaughey. The Stuart Janney III and Phipps Stable homebred son of Lemon Drop Kid won the Tampa Bay Stakes (G3) on Feb. 9 by a half-length last out and also won last year’s edition of the Tampa Bay Downs graded stake by the same margin. Inspector Lynley’s other graded stakes win took place in the Saranac at Saratoga in 2016. He is out of the Maria’s Mon broodmare Criminologist, who was a three-time Grade 3 winner on turf. Completing the field are Hot Springs (post one, Luis Saez, 15-1), Divisidero (post two, Florent Geroux, 5-1), Bandua (post four, Adam Beschizza, 12-1), First Premio (post five, John Velazquez, 8-1), Markitoff (post six, Tyler Gaffalione, 20-1), Final Copy (post nine, Corey Lanerie, 20-1) and Silver Dust (post 10, Jack Gilligan, 12-1). The Muniz Memorial Handicap (4:10 p.m. CT) is carded as the 11th of 13 races on Saturday, March 23 and is also the second leg of a $500,000 Guaranteed All Stakes Pick 4, which kicks off in the Grade 2 $400,000 New Orleans Handicap (Race 10, 3:34 p.m. CT). First post on Louisiana Derby day is 11:00 a.m. CT. The race is named after the longtime Fair Grounds Racing Secretary Mervin Muniz, who held said position for over two decades.